in the beautiful Jávea pueblo. 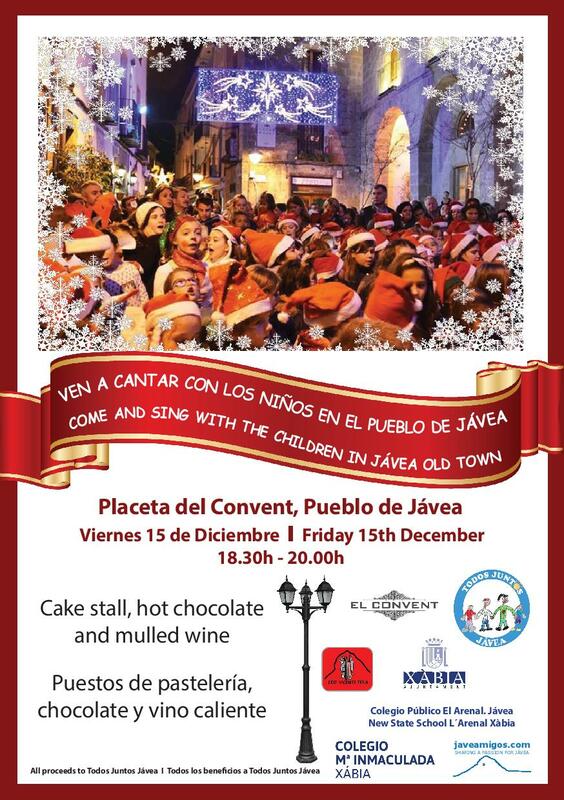 They will be in the Placeta del Convent from 18.30h until 19.30h with children from Vicente Tena, l’Arenal and Maria Inmaculada primary schools. They will sing a selection of Christmas carols in several languages but they need your help to create the very special atmosphere of this lovely event (don’t worry there will be carol sheets). There will be a cake stall and with the help and generosity of Bar El Convent and hot chocolate and mulled wine will be served……………..perfect to welcome the Christmas season and of course Father Christmas will be there too! Entry is free; all that is asked is for as many donations as possible to help some of the most vulnerable families in Jávea who will not be able to celebrate Christmas and Three Kings as we can. Please do come and join us and if you feel able please make some cakes for our stall. We look forward to seeing everyone there and as always the TJJ team give our sincere thanks to our very special members and friends who continue to support Todos Juntos Jávea.